Tuesdays are always a bit of a rush for us with after-school clubs, so it's usually soup night. Tonight's flavour is cauliflower and Stilton. Making soup is soup-er easy (sorry!) and makes a great meal for when we're rushing in and out between appointments. I do have recipe books but these days I generally just throw vegetables into a pan with a stock cube, add about a litre of water and then cook the vegetables until soft. Having an Aga is ideal for this as I can leave the pan in the bottom (simmering) oven for several hours and know that the soup will be ready when we get home. After that, I blitz it in the blender (a nifty trick I learned years ago which allows me to put absolutely any vegetables into the pan without fear that someone will announce "I don't like that") and serve with some bread warm out of the bread-maker. before finally disappearing into the hedge. I didn't see him again so I hope he got back to his nest safely. Back indoors and with the soup eaten (it was very nice, by the way! ), I had another job to do. 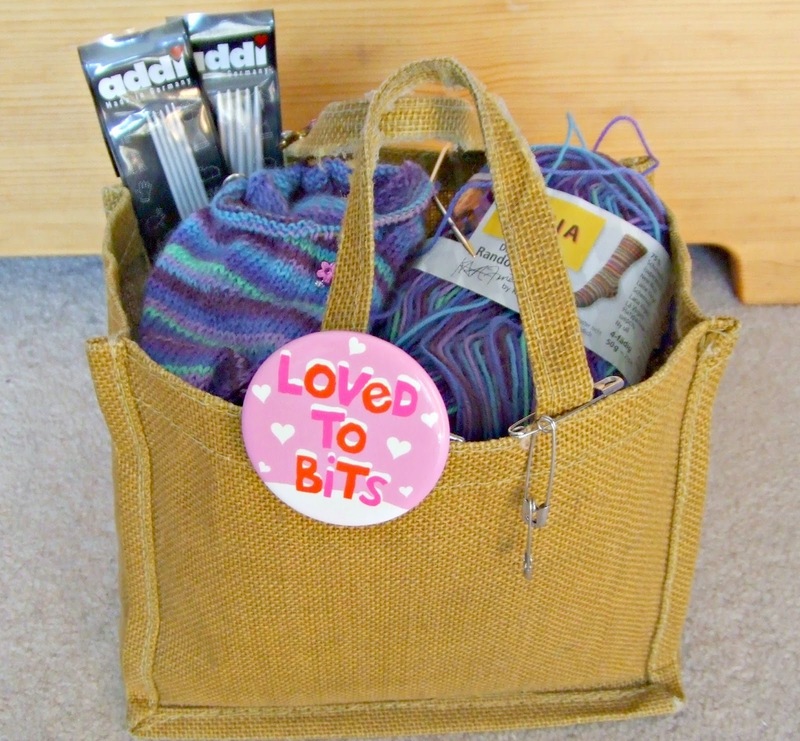 Do you remember me showing you my sock project bag way back in March? I've had it for a good few years now and it's travelled some miles with me. It's been on lots of holidays, for lots of car journeys, to lots and lots of after-school clubs and music classes and to visit friends and relatives all over the world. So it was a sad moment tonight when I had to say goodbye to it - my scissors and pens have poked too many holes in the bottom now and the handles are about to snap so it's time for a replacement. I've bought myself a new one, as close to the shape and style of my old one as I could get, but it doesn't feel quite right at the moment. There's not as much junk in it (it's amazing what you find at the bottom of bags, isn't it?) but it's still a bit stiff and unyielding. I'm sure a bit of travelling will soon sort that out! Tuesday must be a night for creative things. 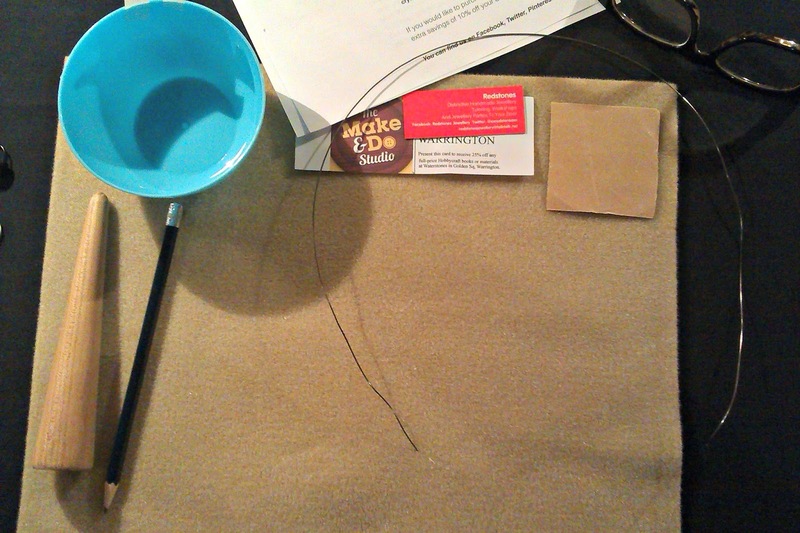 A few Tuesdays ago, big daughter and I went to a workshop run by The Make and Do Studio. It's been quite a while since I last went to one of Maeri's workshops - in fact, it was the curtain workshop in January (and no, since you ask, I still haven't made any curtains!). 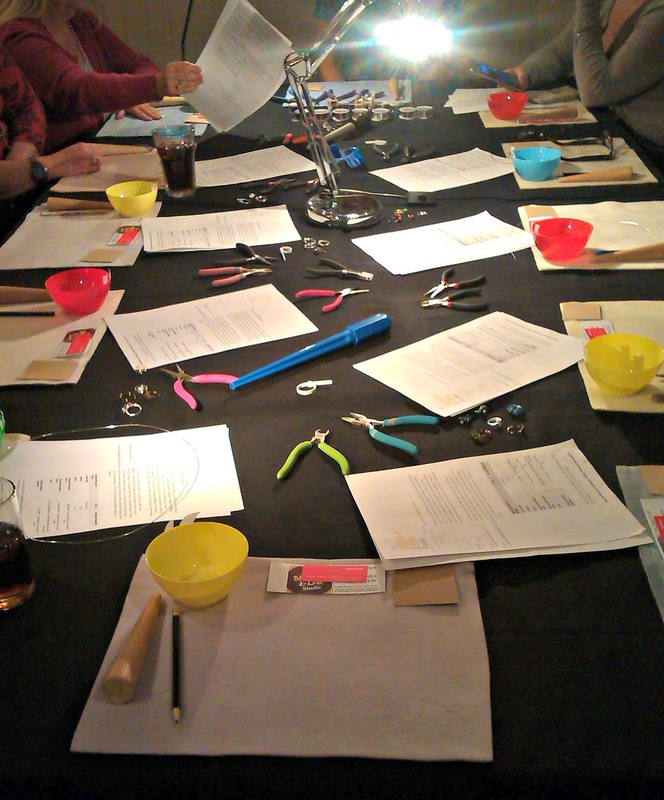 This one was a wire ring workshop held in a lovely pub called The Rams Head in beautiful Grappenhall village. Big daughter has started to make jewellery as a hobby and is producing some lovely stuff. 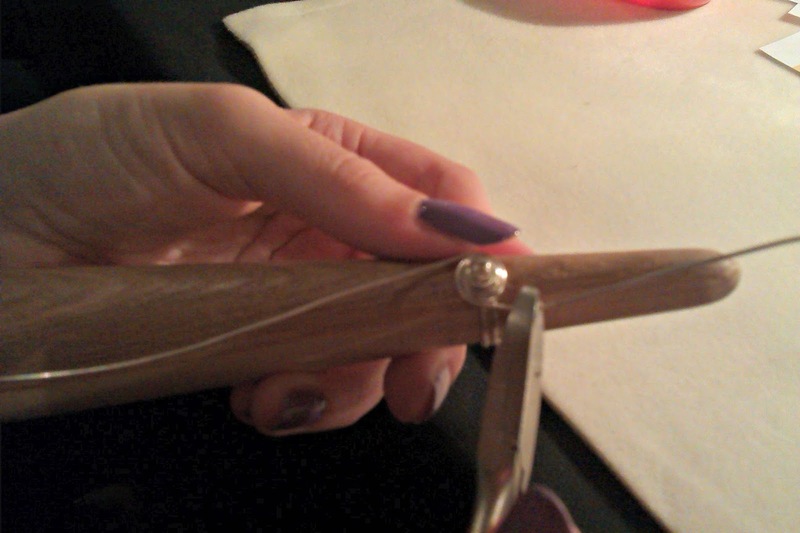 She fancied having a go at making rings but didn't want to go on her own - and I was very happy to go with her! and more tools and ring samples within easy reach as we got started. 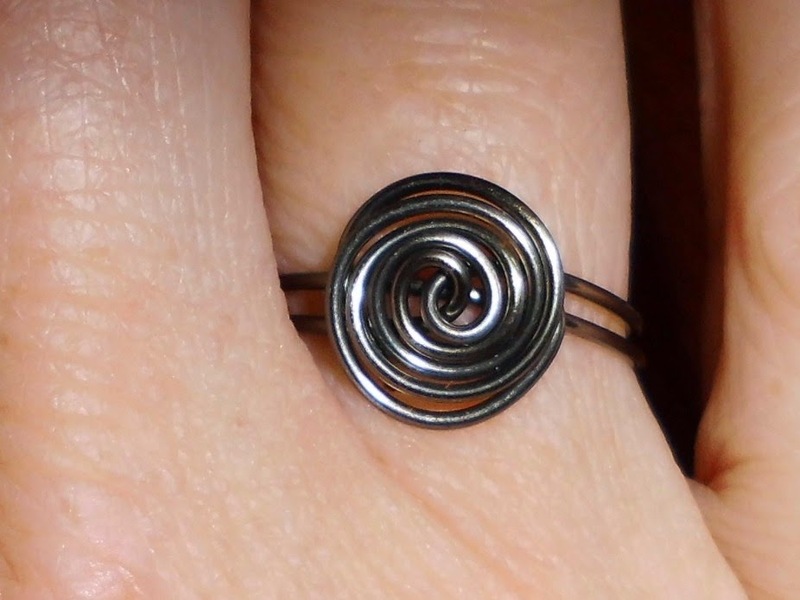 This is big daughter showing how easy it is to create a spiral wire ring - she was much better at it than I was! We had a break for tea and cake - huge cream scones and wonderful chocolate brownies - it would have too easy to have spent the rest of the evening just eating cake and chatting! But instead we continued with our mission and moved onto working with Swarovski crystals. It was difficult not to choose too many but I was determined to go home with something that I would actually wear, not a knuckleduster, so made myself be very selective with my colour choices. 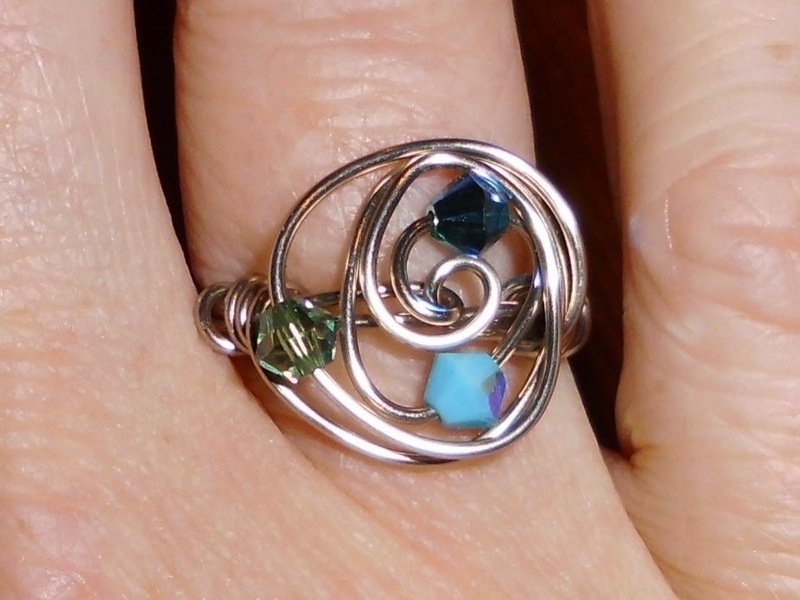 and finally a free-form spiral with crystals. This one's my favourite, I love the way it looks like a little solar system! Big daughter thoroughly enjoyed the evening as well. 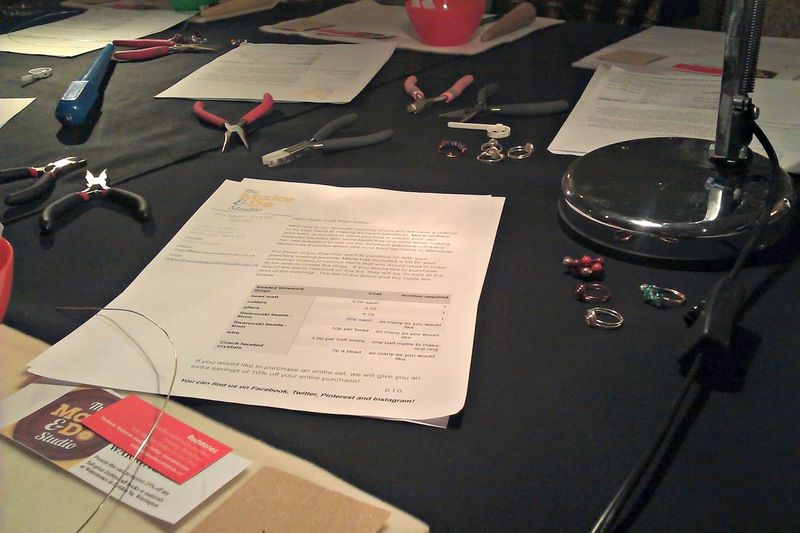 Marie is an excellent tutor, calm and encouraging, and all the participants left proudly displaying new jewellery - some with intentions to create more as favours and gifts for bridemaids at their forthcoming weddings which is a lovely, unique idea. 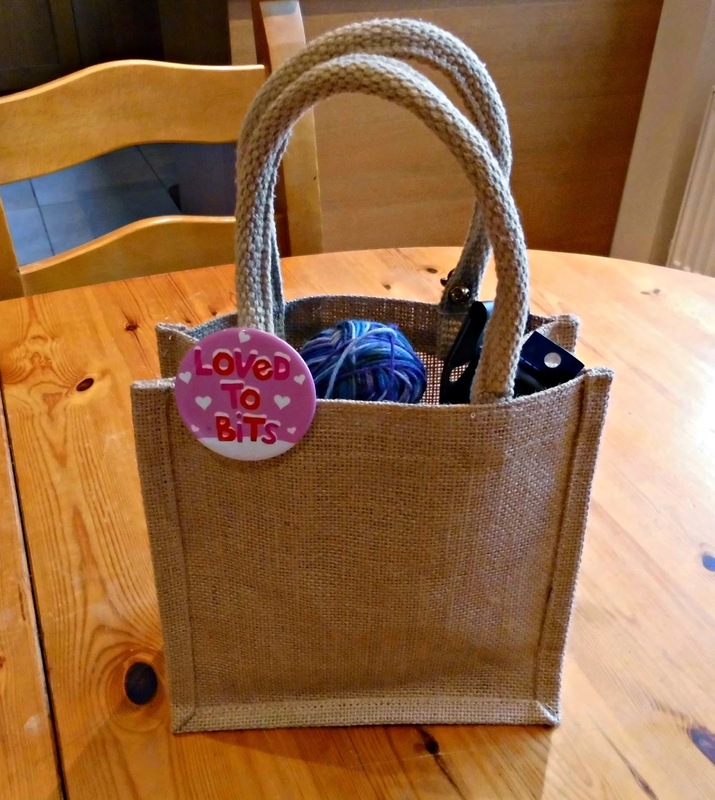 I don't think it will be long before I'm back to The Make and Do Studio - and I have a feeling that big daughter will insist on coming along too! 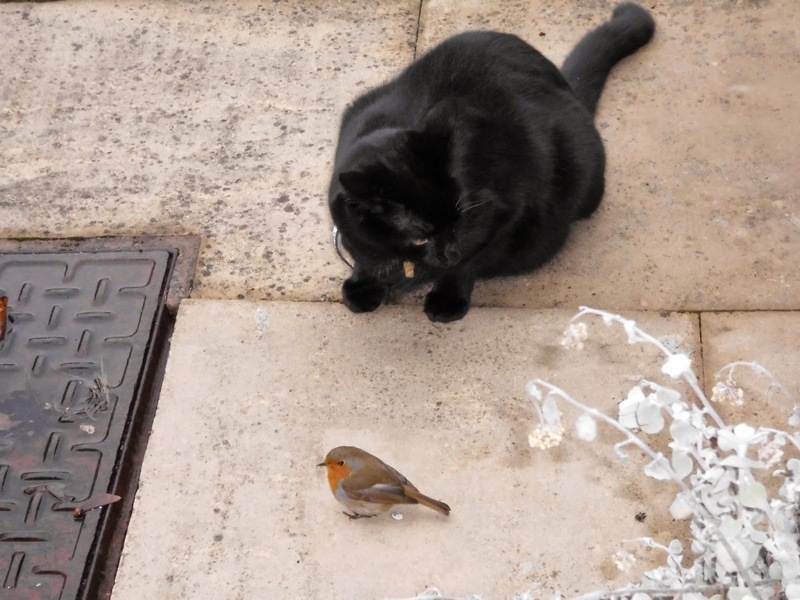 I thought it was going to be a sad tale when I saw your puss cat in the photo with the robin. 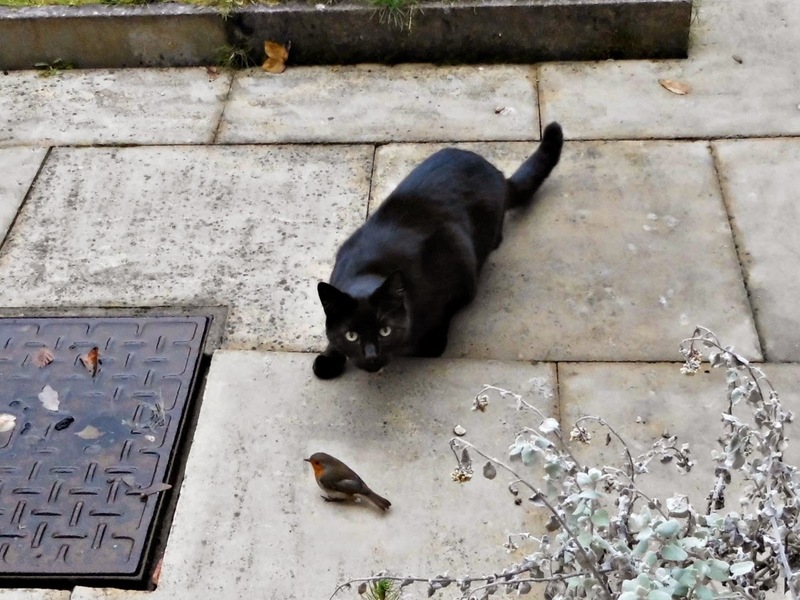 What a good cat you have, I've never seen one sat so close to a bird without trying to eat it before. I love the rings you made and I agree with your favourite choice. Those rings are beautiful! I'm really impressed. I don't wear many rings anymore but if I made some like that I definitely would! Maybe that bird had bumped into a window and stunned himself? Hilarious that your cat let him be! And now I wish I had a bread machine! Thanks, Jen! 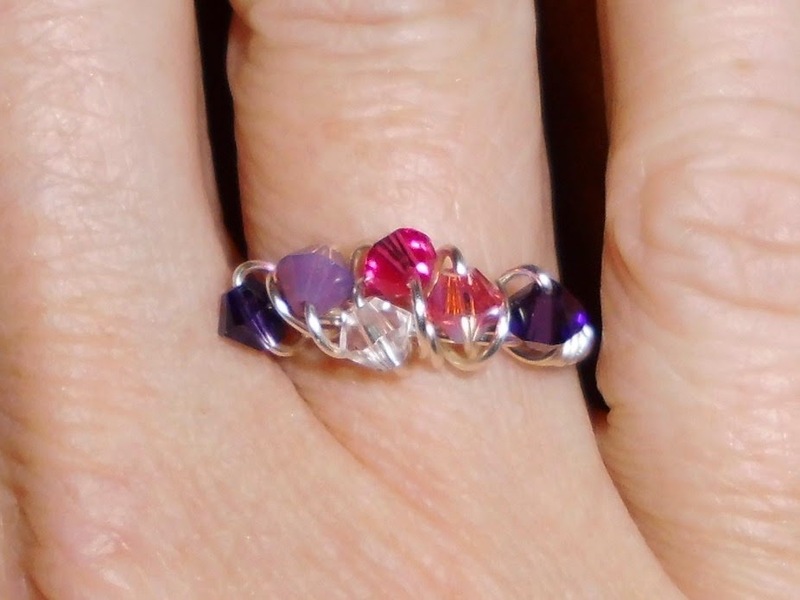 I'm not much of a jewellery person myself but I enjoyed making the rings and I think I probably will wear them if I go out for the evening. 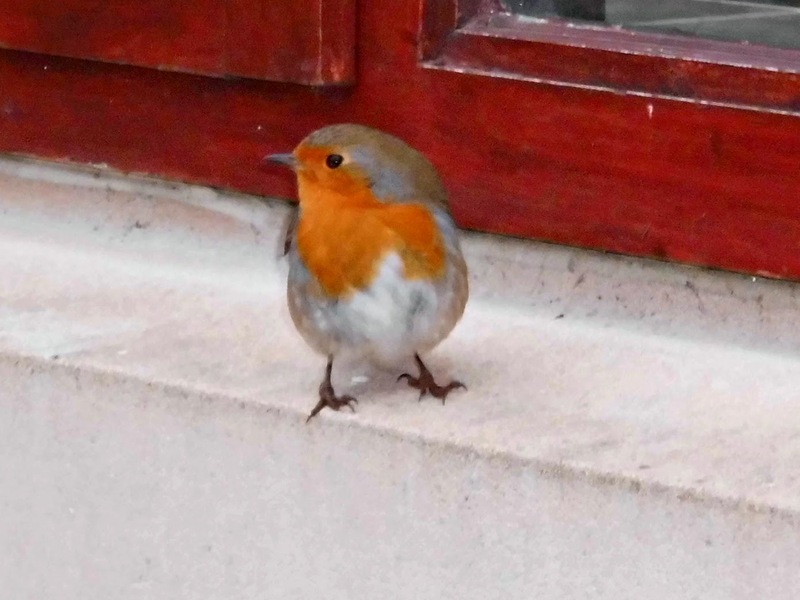 I've no idea what happened to the robin, I did wonder the same thing as you but there were no bird-shaped marks on the window so now I'll never know! It was just lucky it was the black cat that found him otherwise I wouldn't have been writing the story! Cats can be surprising. We had a cat once who much to our relief didn't eat our hamster when she got out of her cage in the middle of the night. In fact it was thanks to him that our attention was alerted and all was well, otherwise one way or another it would not have ended well. Your lovely cat is just like my own dear cat who only died a few days ago. He was a lovely kind gentle boy. We are missing him. He looked very similar and was very handsome and sweet. I can imagine him doing that, either through kindness or silliness and not realising what was in front of him. 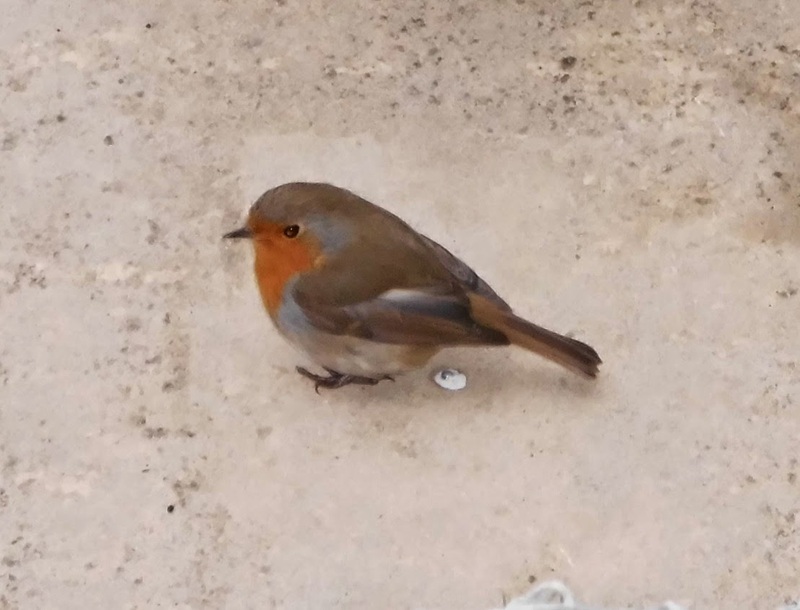 Lucky robin, I hope he is well wherever he is now. Perhaps he will come for another visit. Many years ago my rescued budgie used to sit on our cats head.